People vote for those who do not humiliate them. They vote for those who hold them in esteem, who do not look down upon them, for those who do not have such an unruly expression on their faces, who do not insult those they hold dear. They vote for those who love their God, their religion, their faith. That is the secret behind it. We hope that the 45th president of the United States, Donald Trump, taking over the administration after the months-long election marathon, will be for the good of both the US and world. We expect Trump to revive “the American dream”, which was once the symbol of carrying piety, prosperity, welfare, happiness, liberty, culture, quality, science, technology, the arts and aesthetics to the highest levels. This has been my greatest wish for the US, which I have mentioned at every opportunity for years. In fact, in his post-election speech, President-elect Trump heralded the news of “renewing the American dream”. He stated in the same speech that “he will be president for all Americans”, which is reassuring news for the voters who did not vote for him, especially minorities living in the country. As it is known, during the campaign period, the harshest criticism directed at Trump was based on some of his statements regarding minorities such as Latinos and African-Americans. Through the exaggeration, distortion and provocation of his opponents, such statements, which might have been made due to reasons such as the election atmosphere or lack of information, became a cause of great fear and concern among the said minorities. As a matter of fact, Trump specifically stressed after the elections that his words on these matters were intentionally twisted and distorted. However, it is most crucial that he frequently gives messages of love and unity embracing all segments of society, and reflect this in his policies to soothe this atmosphere of unease and prejudices that unavoidably formed in the public, without delay. Racism, discrimination and regionalism are actually three-century-old problems of certain sections in the US. Regrettable occurrences such as the Ku Klux Klan or the US Civil War are all consequences of these problems. Trump’s opponents trying to create the impression that the US had not been beset by these problems before, and these issues suddenly arose with Trump, is nothing but dishonest demagogy. For example, crimes of violence and murder carried out by the police towards African-Americans for years seemingly on a gradual rise, racist attacks becoming more widespread and the justice system remaining mostly silent in the face of these incidents, are only a few examples of the issues of discrimination. The delirium of presenting all Muslims as “dangerous”, “terrorists” and “criminals” for the purpose of justifying and legitimising the invasions and wars in the Middle East is not new, either. This is another distorted policy that has been pursued by certain circles for decades. The prejudice developed towards Muslims in US society as a result of these policies is an affliction that has been long existent. In short, to the contrary of the image certain opportunist dissident circles are trying to create, Trump is not responsible for Islamophobia in the US. That being said, taking precautions against Islamophobia and eliminating its political and sociological roots should be among the top priorities of the new president. The data provided by certain sources indicates that Islamophobia has become an ever-growing wound in US society. A poll conducted by Maryland University in 2011 revealed that 61 per cent of Americans hold a negative view about Islam. This negative stance has gained more ground among certain segments in recent years. San Bernardino and Paris attacks, hate crimes against Muslims and mosques tripled across the US. A study released last year by consulting firm 416Labs showed that the portrayal of Islam and Muslims in the coverage and headlines of The New York Times presented a more negative image than cancer, alcohol, and cocaine. The study found that there are no positive words in those topics associated with Islam and Muslims, and only 8 per cent of headlines about those subjects carried a positive connotation. 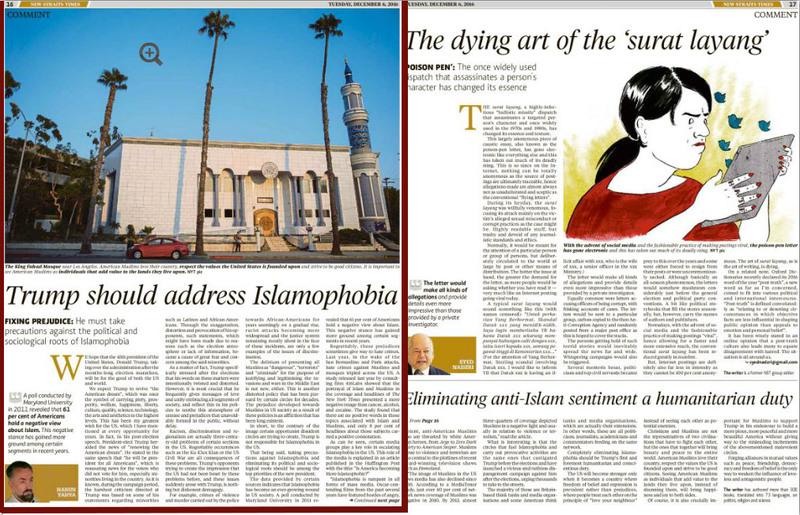 “Islamophobia is rampant in all forms of mass media. Oscar-contending films from the past several years have featured hordes of angry, violent, anti-American Muslims who are thwarted by white American heroes, from Argo to Zero Dark Thirty to American Sniper. Muslims prone to violence and terrorism are also central to the plotlines of recent award-winning television shows such as Homeland. “The image of Muslims in the US news media has also declined since 2010. According to a MediaTenor study, just over 40 per cent of network news coverage of Muslims was negative in 2010. By 2013, almost three-quarters of coverage depicted Muslims in a negative light and usually in relation to violence or terrorism,” read the article. circles that fuel Islamophobia and carry out provocative activities are the same ones that castigated Trump before the elections and have launched a vicious and ruthless disparagement campaign against him after the elections, urging thousands to take to the streets. The majority of those are Britain- based think tanks and media organisations and some American think tanks and media organisations, which are actually their extensions. In other words, these are all politicians, journalists, academicians and commentators feeding on the same network. Completely eliminating Islamophobia should be Trump’s first and foremost humanitarian and conscientious duty. The US will become stronger only when it becomes a country where freedom of belief and expression is prevalent rather than prejudices, where people treat each other on the principle of “love your neighbour” instead of seeing each other as potential enemies. Christians and Muslims are not the representatives of two civilisations that have to fight each other, but the ones that together will bring beauty and peace to the entire world. American Muslims love their country, respect the values the US is founded upon and strive to be good citizens. Seeing American Muslims as individuals that add value to the lands they live upon, instead of shunning them, will bring happiness and joy to both sides. 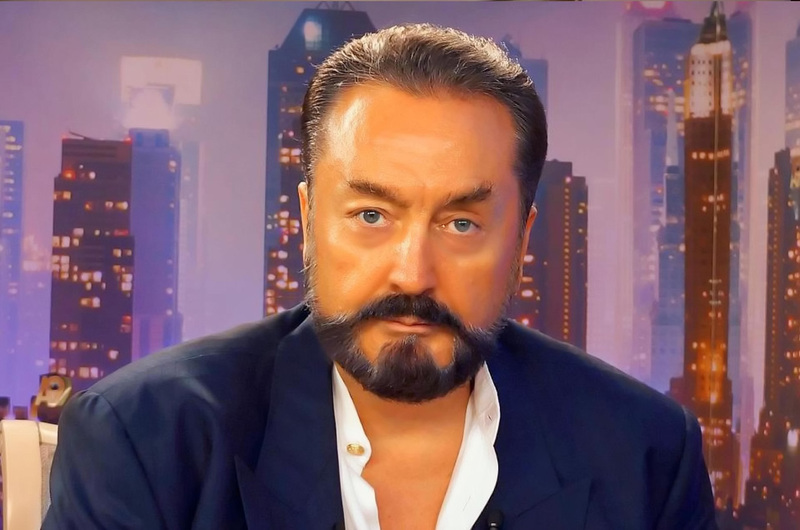 Of course, it is also crucially important for Muslims to support Trump in his endeavour to build a more pious, more peaceful and more beautiful America without giving way to the misleading incitements of the abovementioned malevolent circles. Forging alliances in mutual values such as peace, friendship, democracy and freedom of belief is the only way to weaken the influence of loveless and antagonistic people.